To maximise your chances of getting exceptional pictures on a photo safari, it's really advisable that the person leading your trip is not only a gifted photographer but also a highly qualified and experienced guide. That way you get the best of both worlds in the one person that is going to have the most impact on the quality of your experience at the end of the day. KPSGA GOLD LEVEL (The only female guide out of 26 gold guides in Kenya, highest qualification level possible). FGASA LEVEL 1 (South African qualification). TRAILS GUIDE (South African qualification). 2008 TO PRESENT: Guiding in Kenya, Tanzania, Rwanda. I became a safari guide from when I realized I am happiest whilst on safari, As a young child my parents had always encouraged traveling and being on safari. We travelled a lot and spent a lot of time camping in the wild. I have been very fortunate to have had the exposure and be mentored by some of the best guides in the industry. I decided to turn my passion into a profession and completed my formal training in 2008 in South Africa, with one of the best recognised guide training institutes, Eco Training. 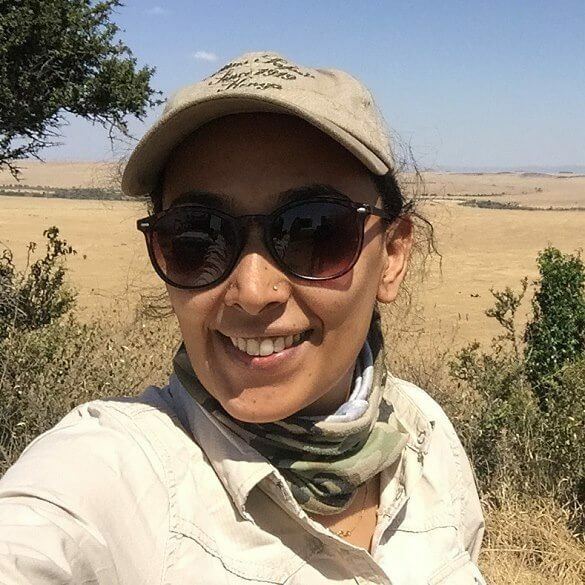 I now run my own photo safari outfit as the only qualified KPSGA Gold level female guide in Kenya. I believe you need to be a walking encyclopedia of the natural world, good interpreting skills, having a great sense of humor, sensibility to safety, confidence and a whole lot of charm. Elephants, they are beautiful, intelligent, empathetic, gentle and wise creatures. Photo safari tours and walking safaris. Recently at a lodge in the Mara, I saw a group of Dwarf mongoose grooming a warthog, who seemed to be enjoying himself immensely. Sit around and tell stories about the mythology of the night sky, while my camera is set to take a dramatic time lapse of the amazing billion twinkling stars. 1991 TO 1995: Started guiding by running "Overland safaris" through East and Southern Africa. Then moved to doing camping safaris through Kenya, Uganda, Tanzania and the Congo. 1995 TO 2007: Guided luxury high-end camping safaris in Kenya. 2007 TO Present: Launched my own safari company and became a partner in Africa's oldest safari outfitter. My love for camping and wide open, remote spaces has pulled me into the "safari world". My degree was in Mechanical Engineering, a far cry from safaris, but this coupled with my passion for photography and natural beauty puts me in an interesting position. I would class myself now as an Artistic Engineer with a love for nature. I love to create using my hands and make things that work well and look good, for example I designed and built our home in Kenya. I now find myself wanting to improve any camping systems I am involved with, to improve how they work from a practical standpoint but also to improve the aesthetics. I have visited half of Africa's countries and find that East Africa is my favourite by far due to its ever changing landscapes caused by vast elevation changes which then encourages enormous habitat diversity and ultimately homes for thousands of different animals species to thrive. If one had to choose one country to do photographic safaris in, it would be Kenya due to its richness of all that makes up a safari. If you have not been to Africa, I urge you to visit as it is life changing. A person who is passionate about what they do, a person who is interested in other people and, above all, a person who is enthusiastic to share their passion with others. In truth, guiding in East Africa is most often self-taught, one really concentrates on the topics you are most interested in and with time comes experience, and as we all know experience cannot be learnt from a book. FAVOURITE ANIMAL AND YOUR MOST MEMORABLE SIGHTING? Lion, the king of the beasts and an unforgettable sighting of a crocodile killing a zebra in the Mara River in Kenya in Aug 2015. I have a great passion for safari photography and love sharing tips / ideas / systems with guests who are out on safari. Africa is such a paradise for those with a camera and there are so many ways to capture some of her beauty. 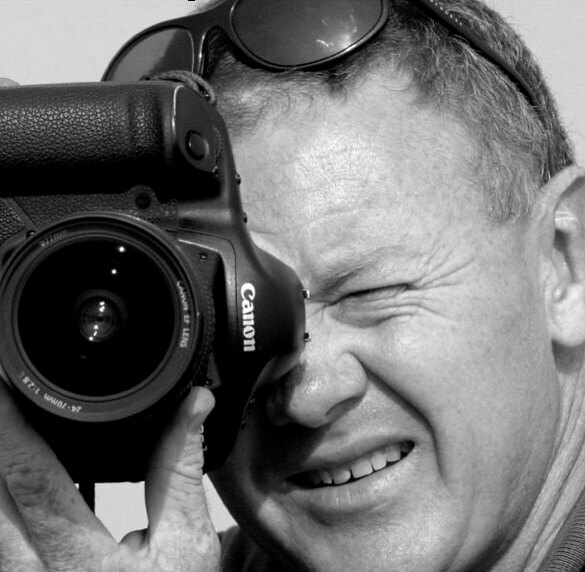 I use Canon equipment and have been fortunate enough to have had 11 digital SLR bodies and a host of lenses. I also have a great interest in reproduction and had I achieved better grades at school I would have loved to have done medicine as I love biology and how things work. I am curious to find out how things work and why they work the way they do, for example, "superfoetation" in rabbits and hares that allows them two pregnancies simultaneously. In a nut shell, being on a photo safari and spending time in Africa is like having Discovery channel on all the time. At the David Sheldrick Wildlife Trust release centre in Tsavo, a place called Ithumba, there are a group of orphan elephants that are being introduced to the wild. These orphan elephants will spend their day feeding in the park, escorted by their "human foster parents". At 11am daily the orphans are escorted to the "mud bath" (a big open water hole) where they are given milk and thereafter can go for a "swim." What is amazing is the number of wild elephants that will also come at 11 am for a "swim." We will often award the "Gnu award" for the most ridiculous thing done by a guest that day while on safari. It is a bit like the "Darwin awards" of the photo safari world. So a fellow guide, (no names mentioned), has had the honour of falling out of his own safari vehicle whilst driving to the Maasai Mara. It must be stated that he was the only person in the vehicle at the time and that he then won the "Gnu of the Year" award. He heard a squeak coming from the rear right wheel of his Land rover whilst driving on a dirt road to the Mara. He then opened the door to see if he could see what the cause was, and while leaning out the vehicle (doing 40km/h) he did not realize that he was slightly pulling on the steering wheel, causing the vehicle to drift to the right and head towards a ditch. On hitting the ditch the jolt flung him out of the vehicle but the vehicle climbed the ditch and headed off across the open plain driver-less. A Maasai elder on the roadside was last seen shaking his head when he looked up to see the driver of a vehicle running across the plains chasing his vehicle. Kenya Wildlife Service Training Institute and Utalii College. Inkwazi Rangers School in South Africa. RWASAGA (Rwanda) Bronze level 5 star. Listed by Condé Nast Traveller as one of 25 best guides in Africa. Winner of the Kenya Eco Warrior awards best guide category. 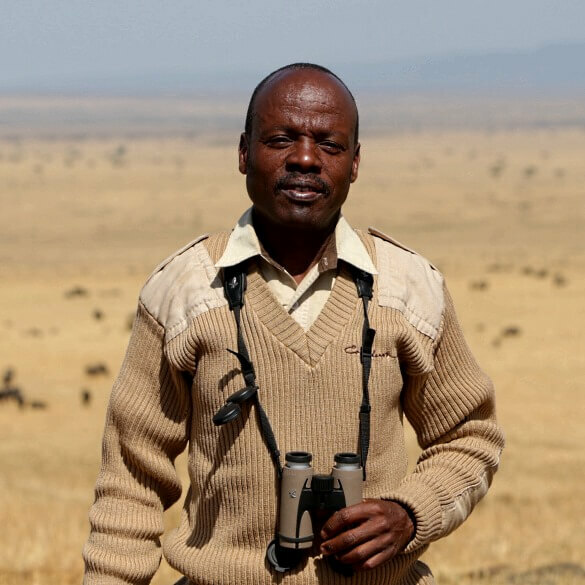 1991 TO PRESENT: Early years spent guiding in Masai Mara in Kenya and Serengeti National Park in Tanzania, but later covered other parks in Northern Tanzania, Kenya, Rwanda and Uganda. I was born on the outskirts of Masai Mara Game reserve in Kenya, and therefore had wildlife interest from an early age. As a herd boy, I used to encounter wild animals while herding cattle in the field far from home. However, what motivated me to be a guide was seeing all the photo safari vehicles that used to pass by our village on their way to the game reserves. Sometimes they would stop to take pictures of us at school or while herding cattle. I told my mother this is my dream career and even though she told me to think of other sensible fields, I had already developed a deep love for the job. Therefore from that early age everything else I took in school gravitated towards a guiding career. I was a member of the wildlife clubs in my schools throughout, and later on took courses and went to colleges for the relevant courses. A good guide must be one with guiding as a passion and nothing short of this. On top of that, one must be a people's person, someone who empathises with other people. This is the way he/she can meet the guest's needs. You also need to be understanding and flexible; since you have to deal with varied guests and you should be someone who is willing to go the extra mile to satisfy the needs of the guests. I love leopards not only because of their beauty, but their nature of shying away from people on game drives, which makes their sighting rewarding since you really have to work for it. I worked with the BBC on the Big Cat Week program as a leopard behavior consultant and tracker during the filming of their program in the Masai Mara in 2003, 2006, 2008 and 2010. Just before they could fully suffocate it, we heard this big crash coming form the bush behind us, only to find it was a Rhino in full charge towards the lions. We had to drive off as the Rhino charged towards the vehicles too. She then charged to where the lions were and they realized the danger, all abandoning their catch, after which the zebra stood up. To the surprise of all of us at the sighting, the Rhino charged and gored the zebra with her horn going right through the animal. She hit the zebra twice and killed it and then proceeded to lie there, resting her head on the dead zebra as if it were a pillow. Every time the lions tried inching in, she saw them off. My area of specialization is professional photography. When I got charged by a lion on foot at Phinda during my ranger training. We came into a small clearing in the bush and went around there a few times trying to find out the final exit path of the lions. When I though I had found it I told my friends and pointed in that direction, and at that moment, the lioness knew she had been seen. She came out in a full charge towards us and one of my friends who had a rifle took off and so did the other who had a machete. I was about to run too but realized I will be the target so I stood there staring at the lioness. I had my hands behind my back so that the lion couldn't see they were empty. All along I maintained eye contact and each time I moved back one foot she came two feet closer, and was getting nearer each time. Eventually my friend who had the rifle came back and stood next to me and we walked backward slowly with the lioness coming closer each time we moved back. It took us about 30 minutes to get out of that situation. There are many other stories to share at camp fire time on a photo safari. Add your photo safari review of one of these guides.